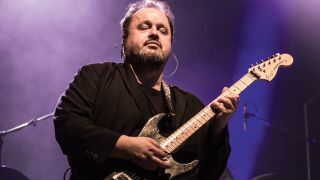 Marillion's guitar man reflects on meeting Neil Armstrong and the horrors of circuitous air travel! What and where was your first gig and how did it go? "I did a thing for the Queen's [Silver] Jubilee. It was an open-air gig outside a friend's house when I was 17, to a handful of people. There's a cassette recording of it somewhere. We played Beatles covers, standard rock stuff. My first original gig was joining Marillion, really - the gig we did was at Berkhamsted Civic Hall back in 1980." "It's two racks for playing the different eras of the band's music. The signal from the pedalboard at the front is fed to a Sound Sculpture Switchblade in the right rack, which switches the signal between the racks. The left rack consists of a TC 2290 Delay/ Effects Controller with an Analog Man DS-1 in loop one, a Boss CE-300 rack chorus in loop two, and a pair of Rockman modules into a Quadraverb in loop five. "The right rack has a Lexicon MPX G2 in the loop of a Groove Tubes Trio into another TC 2290. In loop one of the TC 2290, there is a Roger Linn AdrenaLinn and a Hughes & Kettner Rotosphere in loop two. This returns to the Lexicon G2 for reverb and other effects before being sent to a Groove Tubes Dual 75 power amp. "The system is switched by a Ground Control MIDI switcher and sometimes there's a GigRig G2 'board at the front end for other effects." "A good book, really. There's a lot of hanging around and a lot of travelling on buses, waiting at airports, so some way to occupy your brain without going insane is a good thing. So, a book or magazine - I read a lot on tour." "Well, we have had that one where we're wandering through the bowels of a venue trying to find the stage! 'Good evening, Cleveland…' We were there. And the whole radio transmission thing used to happen, especially in the States with taxi frequencies. So, those are the two that come to mind." "Alcohol and some token healthy snacks. Tequila, whisky, red wine, beer - and then fruit and nibbles, really. No M&Ms…"
What's the best venue you've played from a musician's point of view? "One of the best venues for us is The Music Centrum in Utrecht, which is a classical hall, but it's also great for rock music and it's got amazing sight lines everywhere in the venue, and one of the best audiences in the world. "We've a big Dutch following, but also there are people travelling from other countries to go to that gig, so that's probably the one, I'd say. It's a pleasure to play and it's always electric." "Probably when we flew from Rio in Brazil to Sao Paulo, Sao Paulo to London, London to New York, then New York to Boston as our South American promoter refused to pay for us to fly direct! "I think that took place over about 24 hours. I remember meeting my wife at Heathrow Airport for about 15 minutes on our journey back. We actually went out for dinner when we got to Boston and had some lobster, which I thought was pretty heroic after 24 hours of flying." What's the weirdest thing that's ever happened to you on tour? "Meeting Neil Armstrong's son. Both his sons are fans of the band and his granddaughter's called Kayleigh. We met Neil, I think it was in Cleveland about 10 years ago. That was special. "I mean, Rick [Armstrong, Neil's son] is a good friend of mine and his other son, Mark - Kayleigh's father - both got up and played with us during a soundcheck, and Neil and his wife were there watching. Somewhere in my archives I've got a photo of us all with him. That was pretty amazing: not exactly weird, more wonderful, but very memorable." What's the best tip for getting the audience on your side? "It depends how open the audience are. If you're playing to a load of farmers in Eastern Europe somewhere, they're probably not going to be impressed, no matter what you do. But, in other places, if there's a passion for music, and even if they don't necessarily know the songs, they'll just pick up on what you're doing and get into it." "Nothing really marked. I mean, sometimes I'm practising on the guitar in the dressing room, but only if we're playing something I'm a little bit vague about. When we do our Marillion Weekends we play three nights in a row with different sets, so there's sometimes seven or eight hours of music you have to try and hold in your brain. "Quite often I'll be practising just before I go on, to try and burn in the last few notes of some solo that's making me trip up. Maybe a few hand flexes just before we walk on, but no shredding regimen or anything." What's your favourite live album? "Probably the very first one I ever bought, actually, which is the Genesis Live album. I think that Thin Lizzy's Live And Dangerous is a fantastic live album as well. It would probably be between those two." Marillion's new album F.E.A.R. is out now on earMUSIC.